Luckily, I’m here for you. These delicious desserts were created by Jennifer at Cups and Cakes Bakery, in San Francisco, California, and she was kind enough to let us come in and record the entire process. 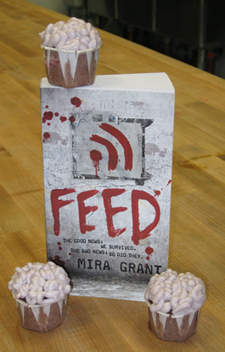 Here’s how you, too, can create delicious bite-sized brains for you and your victi…er, guests. First up, a quick instructional video, followed by a detailed recipe. * A decorating tip (I recommend a Wilton’s Round #6 or #7). * Cherry flavoring (the juice from a jar of maraschino cherries should work). …what, you don’t expect me to tell you how to bake, do you? Trust me, unless you like the taste of flame, you don’t want that. The first thing you need to do is get the color of your icing right. The cherry flavoring will not just make your icing delicious; it will make it pink. This is good. Add cherry flavoring to your icing until you have a pale, medium pink color–the sort of thing you’d use for a My Little Pony cake at an eight-year-old’s birthday party. If you don’t like cherries, you can use red food coloring. Or human blood. Whatever makes you happy. Once your frosting is nicely pink, get out the blue food coloring, and add a drop. Mix thoroughly. Add another drop. 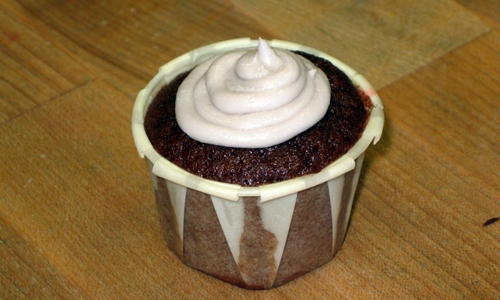 Repeat until your icing has turned an unpleasant shade of grayish-pink. 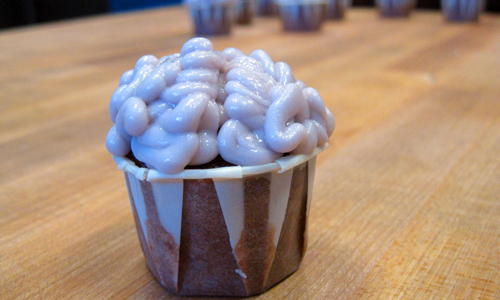 It shouldn’t take much, and you don’t want to overdo it–brains aren’t meant to be purple–but once you get the color right, you’ll have something nicely vile looking. Load up your pastry bag with icing, and let the fun begin! 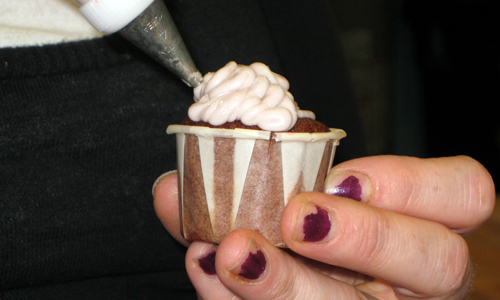 Step 1: Make a little mound of icing at the center of your cupcake. The key word is “little”: this is going to give height to your brain, and we want human organs, not giant mutant globes. That’s another kind of cupcake. 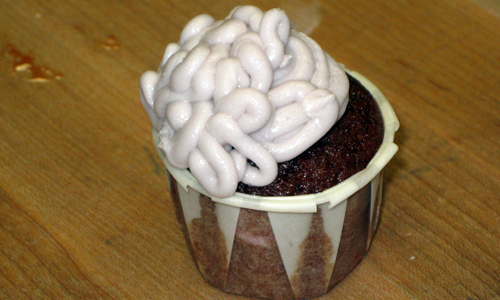 Step 2: Choose a “hemisphere” and begin using your frosting to make little ripples and whorls. You should only need one continuous line to make the right sort of messy, biological, gooey-looking ridges that you’d get in a real brain. Step 3: Turn the cupcake around, and repeat on the other hemisphere. If you’re going to be serving these to an appreciative audience, you can improve your presentation by putting them in the fridge for half an hour or so to set the icing, and then dripping just a bit of cherry juice on the brains and the plate when you bring them out (this won’t work with red food coloring, unless you want to resemble a Troma flick). It’s so simple, and disgustingly delicious!